What is Jurassic Boy 2 NES? Jurassic Boy 2 is a blatent ripoff of the Sonic formula, and doesn't even try to hide it. In the year 2193, "Dinosaur" becomes a popular subject again. Scientists all work for making dinosaur revive. Nevertheless, they still lack of a special gene. This causes the dinosaurs they cultivate are all incomplete. Many countries then intend to buy dinosaurian fossil at high prices in order to get the gene. But it seems that it's not so easy. No one can do anything to this problem until Dr. Crachi invents a "Time Space" machine in the year 2197. The game was created by a company called 'Sachen', or 'Thin Chen Enterprises', who live off little knock off games like this. 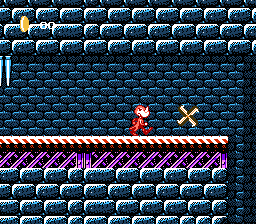 You follow 'Chen' the Dinosaur as you run across bridges, over spikes, and around loop-de-loops, just like Sonic. This is the original NES version of the game, which was later ported to the Gameboy Colour [see its own page]. This version has a Red sprite for Chen, rather than the purple one seen in the GBC game. This clashes with a lot ot eh background. 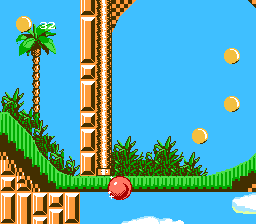 Despite being on the NES and GBC, the game actually runs quite fast, almost matching Sonic himself. 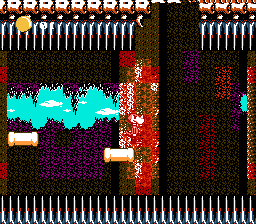 Unfortunately the game itself is incredibly buggy and enemies seem to just be randomly placed around the levels.